This book, by Marin Journet, first appeared in 1963 and was reissued in 1997. 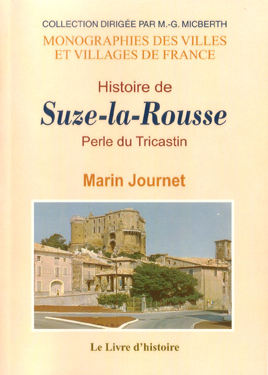 The ancient village of Barbaras was located near present-day Suze-la-Rousse and M. Journet's history includes a passage about it. The passage is presented here as we seek permission to use it. "A roman village that overlapped the territories of Bouchet and Suze, Barbaras was, in the Middle Ages, a fief of the princes of Orange and later of the popes. In 1294, Bertrand II, Prince of Orange and Lord of Suze received the homages of his vassals from Camaret, Joncquières, Sérignan, and Barbaras. The village name would have come from a great battle: "very barbarous" without doubt, undertaken in ancient times. But, according to François Burckard: Barbaras originated instead from the word "Barbaras" meaning "uncultivated, savage". The same origin is found in the name of the commune Barbières in the Barbière district of St. Paul Three Castles, in the name of the area called Barbeyrac, in that of the forest of Barbarais, etc. In the 14th century, Barbaras was completely annihilated by the marauding gangs known as the Routiers, [ed. http://en.wikipedia.org/wiki/Routiers]. Originally, the fief belonged to the Count of Toulouse who ceded it, in 1210, to William of the Baux to fulfill his obligation of homage. The ecclesiastical annals relate that a large assembly of prelates held it in 1043 under the directorship of William III Count of Provence. The chapel was deeded to St-Quenin, bishop of Vaison. The council of 1043 resolved several questions concerning locales and sanctioned the donations made by William III. Present were the archbishop of Arles, Embrun, Aix, Apt, Carpentras, Vaison, St-Paul, as well as several abbots of the Provencal monasteries and several squires such as Volverard, Chevalier of Arles, and William of Venasque. The barony of Barbaras became part of the house of Suze, the same as Barri, by the acquisition that the Pierre of the Baume made of Jean of Pictavie (probably Jean of Poitiers, lord of St-Vallier, in 1527). It is most likely that Pierre of Baume-Suze acquired this barony from John of Poitiers St-Vallier in 1527. The Poitiers had other assets in the region, in the archives of the castle were found notably an homage from Jean of Isnard to Diane of Poitiers for the Garde-Paréol , in 1566. A jurisdiction was attached to the barony of Barbaras and a small building next to the main farm was until recently known as the "Le Greffe". The Count of Suze was the chief Justice of Barbaras. Toward the end of the 19th century, a great mosaic was discovered, certainly dating from the gallo-roman times, as well as the brick tombs and the fragments of arms and of black-clay pottery were found in great quantity (L. de Laincel). May these pieces of information engage the curious, the hikers, or those discarding a bike or car to really undertake the aforementioned excursions."